Can anyone help ? 1954 Patent description (the second) says that feet " are joined together by'means (???) of a flexible band which may be made from spring steel or other suitable flexible material ". Maybe the 50's band is made of metal and the 60's band is made of plastic ? Any other differences? Please share your photos, if you have. Thanks ! Maybe the 50's band is made of metal and the 60's band is made of plastic ? Definitely not. I don't know when the all-plastic bases were made, but whenever they were made, it was a very short-lived experiment. The metal ones were always the norm. Here's the plastic one for anybody who hasn't seen one before. Oddly enough, they seems to have a thin layer of either wood or some other fibrous material on the bottom of the feet. And notice that the early ones used flat slotted screws, not the bulky and awkward thumb screws. But by about 1954 the Melita specs had pretty much solidified (cast metal body, thumbscrews, plastic base ends connected by a metal band) and remained the same for the rest of the company's run, occasional aberrations like the all-plastic base notwithstanding. The NOS unit I got in '83 (with box and directions. IIRC there was a picture of a dog listening - almost like Nipper the RCA dog) looked a lot like the one on the DuoJet above though the thumb wheel looked different. The early ones were made of machined aluminum; they quickly switched to cast pot metal which could bend or break under string tension. I'd check out the Embie versions if I were in the market, but the current Gretsch units are almost identical to the last iteration of Melitas. A few shady guitar vendors were passing off the new Gretsch ones as New Old Stock even though they're clearly marked Gretsch where the originals weren't. Gretsch didn't apply the Melita to any of it's 1960's guitar models, so I really only think of it as a '50s feature. 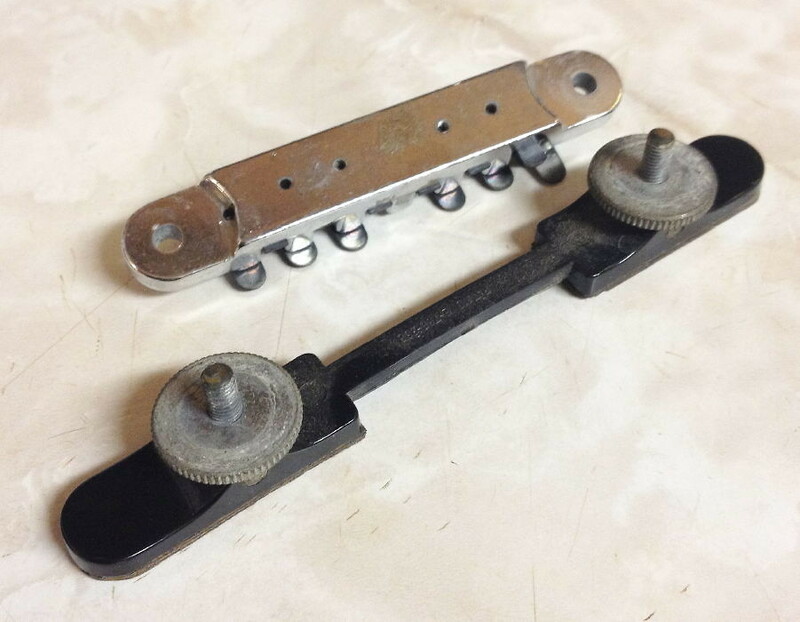 I guess they were probably available as an after market bridge applicable to any brand guitar in the '60s but I haven't seen many. Any version is a PITH (hand) for those of us that mute the lower 3 strings with the heel of our right hand - or left if you're a lefty! Regardless of the originals - any version - or the newer Embie, they look very much overly busy. This busy appearance spoils the overall look of the guitar for me, which therefore makes it ugly as well as uncomfortable. Sorry Dave, but I have to disagree. The thumbscrew version is a bit uncomfortable at first, but after minimal acclimation they're fine. With the low profile slotted screws, Melitas are very user friendly. If anything, they accomodate more subtle palm muting. They certainly don't inhibit it. Okay, I'll take your word for it that the newer ones are more user friendly than the old ones but looks-wise, visually they're as complicated looking as the bar bridge is simple. First time I saw one years ago my first impression was, what the hell are all those parts for? A long way to go for intonation adjustment! Now having said my piece on this style bridge I will say that the space control bridge that came along after was frankly a dumb idea. At least the original Melita had a definite purpose, to provide intonation but the space control is no better than a bar bridge in this regard and instead has the ability to space the strings. Who changes the spacing of their strings or even wants to ?? String width is set by the bridge and left alone so this bridge is a WTF. And it's also quite uncomfortable to rest the heel of your hand on to mute the lower 3 strings....but is a tad better looking than the Melita. Next up was the AOM and I have one on my Super Chet and I quite like it. It has the intonation adjustment feature and is comfortable for my hand. Mine doesn't rattle like some report and doesn't inhibit the sound/tone and looks compact and just fine. 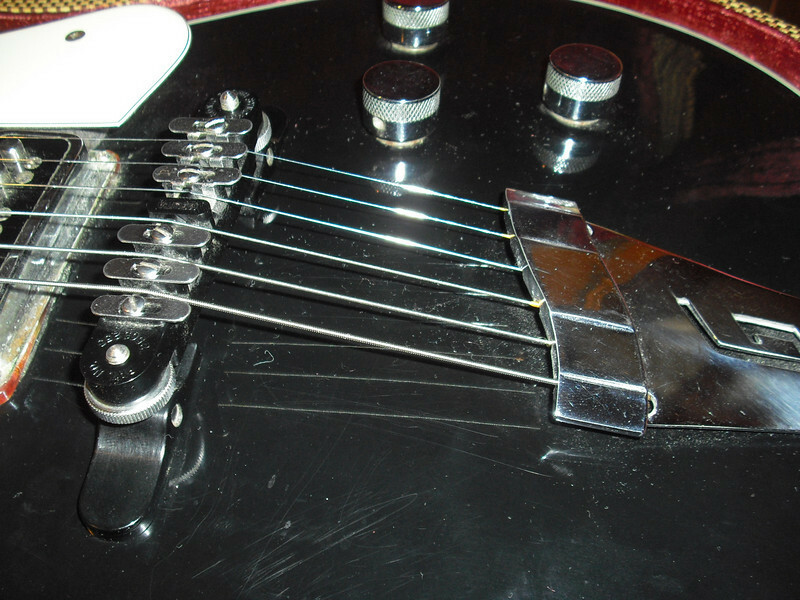 I have a roller bridge on my pre-FMIC 6120 Blue Burst and it works fine too. I haven't fixed up this guitar yet with funds being devoted to my restoration project. My plan is to eventually swap out all the hardware for TV's along with a pair of his Dyna's and add a Chet arm. I'm going to go with a Serpentune too and put flats on this guitar.....I'll pin the new base as well. The point for me is I'm not fond of something on a guitar that stands out. For me, I prefer all the pieces to make one pretty work of art so one oddball thing, such as the Melita bridge, in my eyes, glaring at me, demanding visual attention. Everyone's MMV but right wrong or indifferent, that's mine. I don't happen to own a guitar with a Melita bridge, but I actually find their appearance to be very cool. There is a simple elegance to it in the same way that one admires a highly functional piece of machinery or an old vintage automobile. I am told that the Melita worked well in terms of allowing the guitarist to properly intonate the strings, so I don't find much to dislike about them. The screws would be the only objectionable aspect of them for me. Au contraire, mon frere. It was actually the original Melitas that had the low profile screws. Gretsch rediscovered the appeal of the slotted screws a few years ago. Okay, it's been established that the Embie and the older Melita's are the comfortable ones. I'll give you that and for some one wanting the vintage look, knock yourself out - different strokes for different folks. I'm glad you folks are happy with how they're working for you. If I ever find a Gretsch at a fire sale price that I can't refuse that has one of these bridges, I won't keep the bridge on it if I decide to keep the guitar, vintage or no.....it would go in the case and a serpentune would go on. I recently stumbled onto several of these topics which made me (re)join here. Sorry to be late to the party, I thought I had a membership here years ago but maybe inactivity removed my account. In anycase, thought I'd throw in the mix. A few years back I found a picture online that showed a collection of the varied early types. Scotty Moore himself had one of the early types on his ES295, aluminum I believe with the ebony/rosewood base and double thumb wheel height adjusters. The guitar we believe(d) to be his has the early slotted screws though I can't confirm yet from several pix that he didn't actually have thumbscrews at the time. They made the transition about the time he had one. Here is a crop of the photo first mentioned along side a picture of the one said to be his. Welcome back. We had a data-base meltdown a couple of years ago and much info was lost. Slot-head screws would have been replacements easily done as the holes on the Melita are a standard thread size (10/32?) and probably preferred due to their lower profile. IIRC Melitas always came with the tall knurled finger screws. Pretty sure the earliest (double thumb screws) ones always used bakelite or some other hard plastic for the feet which had a square hollow aluminum piece as a connector. The aluminium ones were early and much sturdier than the standard pot metal variety which can bend and break under pressure. Looks like the three bottom ones are the very early plastic bridge variety. Didn't know Scotty had these on his Gibson; any history you would want to share is always welcome as there are a lot of Scotty fans here. Thanks LX. Its been my understanding that the screws were standard until 54 and then they started using the thumbscrews, but don't hold me to it. Most of the details to their history is relatively new to me. I only knew he had a Melita on the 295 and though I'd seen and held it over the years it wasn't until looking at pix of one of the tribute ones Gibson gave to one of our friends that I noticed the slotted screws. I had to go back and look again at the pix of Scotty's. I'm still collecting the high res pix of him from 54/55 from sources to try to clear it up. I wish I had thought to ask him when he was alive. Thanks for the link and an interesting read. Had no idea about the ES-295/Melita connection. Published Gretsch historian Ed Ball would be the one to know about the early Melitas as he has several including (IIRC) one of the bakelite versions. Keep watching as he may chime in here. You are a very lucky guy to have met Scotty and to have played that guitar. I got a NOS Melita in the early '80's to tame intonation problems I was having with my '56 6120 and was glad to have it, tall screws and all. Wholesale musical merchandise distributor Grossman (Cleveland, Ohio) used to list brand new Melita bridges in their catalog. This would have been around 1987 or so. Grossman was the parent/distributor of Grover and Trophy products. Yes, early Melitas had flat slotted screws until '54. Most Melitas (maybe all, originally) on '53 Jets and proto-Clubs had them. By sometime in '54 they seem to disappear. As with most "feature" evolutions, there seems to be some possible overlap. Here's an early one... aluminum body, double adjusting discs, flat slotted adjuster screws, and the wooden feet that Afire mentioned. A slightly later ('53ish) "bakelite" body model. Awesome! Is this one yours? Best bridge ever. I put them on everything except my Strat, for obvious reasons. This thread inspired me to futz around with my Synchrosonic bridge and make some taller saddles. Mine are laser cut acrylic. You have to lower the body of the bridge to keep the same string height, but it's a lot easier to palm mute! Close up of the saddles. I tried using delrin first, but the laser melts it. I've got some bakelite coming to try, but so far I like these acrylic ones as they have a nice bright attack. Here's a close of some of the saddles.